ETS Glock magazines are much less expensive options for Glock shooters. Elite Tactical Systems (ETS) has announced their Glock compatible magazines, designed for the most popular models in the prolific Glock line, should be shipping to distributors by end of this month. Elite Tactical Systems has already made a strong name for themselves with their high quality and durable, polymer AR-15 magazines. The addition of magazines for Glock pistols, still the most popular semi-auto handgun in the United States, should bode well for ETS. The ETS magazines are designed with scientifically proven design and construction to ensure the polymer magazines not only function, but will be durable enough to stand the harshest conditions. The ETS Glock magazines have a smoky, clear body. UPDATE: BlueSheepDog was able to test fire multiple ETS magazines at a special range night hosted by Faxon Firearms during SHOT Show 2016. We found the ETS magazines to function flawlessly, and their construction to be very good. Check out our full review here. The ETS Glock magazines are another option to what was once a closed market. 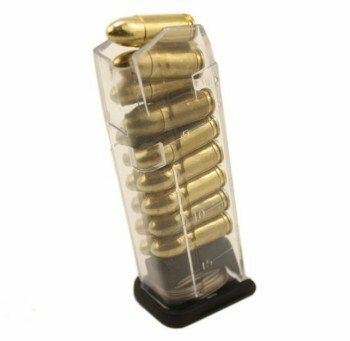 The addition of these magazines should be welcomed by Glock fans. For decades, the only Glock magazines available came from Glock at a premium price twice the price that ETS plans to sell their magazines. As a Glock fan myself, and a daily carrier of Glock both on and off duty, I am thrilled to finally see the competition adding affordable alternatives to Glock shooters. 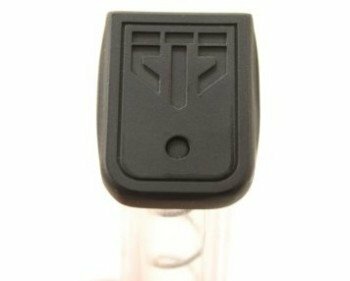 ETS floor plates are interchangeable with other Glock compatible options. All of the ETS Glock magazines will be manufactured with the same smoke material of the ETS AR-15 magazines. The ETS Glock mags will also be compatible with all aftermarket floor plates allowing user preference. The Extended round 9mm magazine will have a 22-round capacity, but still is just slightly longer than the standard G17 magazine. Measuring 141mm ETS claims this magazine should be legal for competition shooters to use in their sport. 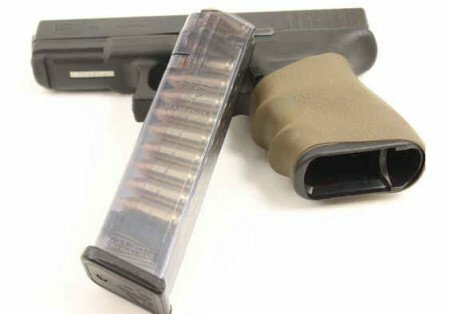 The addition of this magazine offering is a perfect middle ground for the standard 17-round G17 magazine, and the noticeably longer 31-round G18 magazine. The G18 magazine (left), with the 22-round option (center), and standard G17 magazine on right. Though Elite Tactical Systems is only producing one .40 caliber option, the standard G22 magazine, they promise that there will be more .40 caliber offerings in the months to come. That it is very good news to the .40 fans, like myself, who carry those Glock models every day. In addition to the standard style magazines in various capacities, ETS will be offering a “TapLoader” model as well. 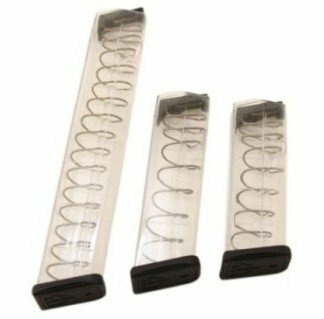 These magazines are specifically designed to allow the shooter to release a locked open slide, and chamber the first round, by simply “tapping” the magazine when loading. Though initially only offered in the G19 version, additional models of the “TapLoader” are planned to be released in the future. The standard Glock training teaches the shooter to insert the magazine into the magazine well and then lock the magazine into place by a quick and forceful insertion motion with the palm of the loading hand. At that point the shooter should use their support hand to reach over to the top of the slide to pull the slide backwards and then release the slide to chamber the first round. However, I have found that the more I use Glock pistols, a hard tap of the magazine during insertion can cause the slide to close. That is fine, as long as the shooter is aware it could happen. The ETS TapLoader magazine will prepare the shooter for this opportunity so there should be no surprises. In January, Magpul announced at SHOT Show they were releasing their own version of a Glock magazine. Despite beating Elite Tactical Systems to the spotlight of new Glock magazines, the Magpul Glock magazines are currently only compatible with the Glock Model 17 in 9mm. An example of the Magpul Glock 17 magazine. Elite Tactical Systems listened to the ground swell from their customers, and made a strategic decision to postpone their Glock magazine debut until they could offer a multitude of magazine options in several calibers and capacities. I think the decision by ETS will pay huge dividends, as customers will find many of the most popular Glock models available in this initial production. In addition, as some may already know, Elite Tactical Systems recently settled a patent infringement lawsuit with Magpul in regards to their AR-15 magazine design. In that settlement ETS agreed to change their follower design to avoid similarities with the Magpul version, and to pay royalties to Magpul for the six months of production of the disputed AR-15 magazine. By taking their time this go around, there should be no problems of conflict with Magpul, while at the same time offering a uniquely designed and formidable alternative to the popular brand name. The following video shows the toughness of the ETS AR-15 magazines. The ETS Glock magazines are made from the same material as their bigger AR-15 brothers.